Our Park Snooze and Fly Package includes 30 days of free parking at the hotel near Fort Lauderdale - Hollywood International Airport while you're enjoying vacation and a one night's stay at Fairfield Inn and Suites the night before your flight. Alternatively, we can provide hotel accommodations on the night of your return. 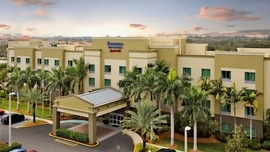 Lastly, shuttle transfers will be provided to Fort Lauderdale - Hollywood International Airport when you depart and transfer you back to Fairfield Inn and Suites upon your return so you may get your vehicle. If you have a late landing, staying the night of your return is also an option. You can take advantage of parking your car at the hotel prior to your flight and getting well rested at the hotel the night of your return. Our Park Snooze and Fly Packages are an excellent way to make airport parking convenient and affordable. The Fairfield Inn and Suites allows late arrival check-in so you know your room will be ready even if you have a late landing. Cancellation policy is 11:59pm EST two days prior to arrival for full refund. For full details on our Cancellation Policy, please view our Policies Page. 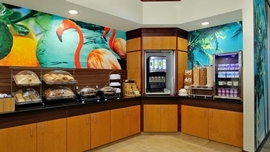 This select service property is a moderate-tier hotel chain with a main goal in mind: efficiency! 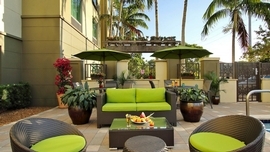 The hotel prides itself in its ability to assist the business traveler accomplish anything. You'll find workspace throughout the hotel and in your room, touched by creative design and modern taste. 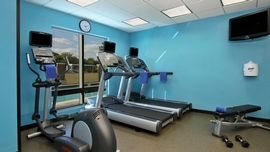 The hotel offers plenty of amenities, including a business center with printing capabilities, 24 hour fitness center, 24-7 Market, free coffee and tea, and a complementary hot breakfast in the morning--serving scrambled eggs, sausage, and more! The entire hotel has free Wi-Fi, and the hotel also offers free high-speed Internet as well. Your room will have a mini-fridge and a microwave. Should you need something more, just ask the front desk! This popular option has a longstanding 25 year history, with over 700 locations across North America. (*Please note: Fairfield Inn & Suites properties have both standard rooms and suites. Our packages only include standard rooms.) Click here to see all of our Fairfield Inn, Fairfield Inn & Suites hotels which we offer in alternate cities. Transfer Note: Hotel offers transfer TO the cruise port for free for up to 2 people per room. Additional people are approximately $10.00 per person. *SPECIAL NOTE FOR CRUISE TRANSFER SERVICE* For arrivals 01-01-19 thru 04-21-19, Fri-Sun: Hotel does not include cruise transfer. Clients must pay approximately $10.00 per person for transportation to the cruise port.